Jeanette received a BA in fine art and photography from Columbia College (Chicago) in 1985. She moved to Maui in 1989, where she lives a peaceful life in Maui’s tropical upcountry area. Jeanette comes from the school of expressionism, and her artwork is a visual form of soul to soul communication. Her paintings range from figures to complete abstractions, and from impressionistic landscapes to landscape in the spirit realms. Through mixed media paintings she strives to express the deeper emotions a of life and make seen the unseen spirit that runs through all things. 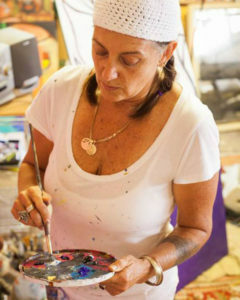 In 1991, Jeanette created Cultural Creations Maui, a unique line of jewelry made from antique cultural artifacts, antique African trade beads, rare shaman amulets and antique coins from around the would. These pieces are all one of a kind and include a detailed history with each piece. ???? Visit MauiBeeWell to view Jeanette’s organic medicinal products. ??? ?